I came across this cupcake recipe on Annie’s Eats a week or so ago and knew that I had to make it for my family for Christmas. These cupcakes are unreal. 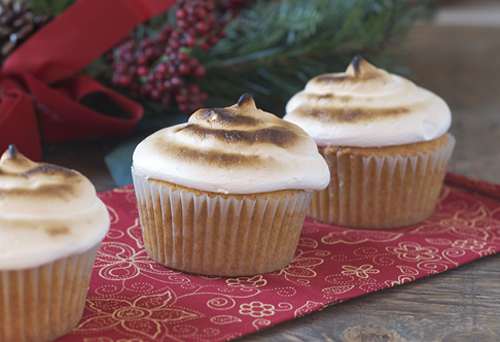 The sweet potato adds so much extra flavor to the cupcake and the frosting is one-of-a-kind. I wasn’t sure what it would be like, but when I tasted it I was instantly hooked; it honestly had the exact texture and flavor as roasted marshmallows! I think that these are my new favorite cupcakes. If these aren’t your type of cupcakes, try my raspberry stuffed cupcakes or my snickerdoodle cupcakes. Preheat the oven to 350F and place 24 cupcake wrappers in trays. Mix together the flour, baking powder, baking soda, salt and cinnamon in a medium bowl. In the bowl of an electric mixer with a paddle attachment, cream the butter and 1½ cups sugar on medium-high speed until light and fluffy (about 2 minutes). Next, add the sweet potatoes and vanilla extract. Reduce the speed to low and slowly add the bowl of dry ingredients until just combined. Using an ice cream scoop, fill each cupcake liner ¾ full with batter. Bake at 350F until toothpick comes out clean (about 18-20 minutes). Let cool completely before frosting. For the frosting, combine the egg whites, 2 cups sugar, cream of tartar and 2 tsp vanilla extract in the top of a double boiler. Heat to 160F, stirring frequently. Pour the mixture in to an electric mixer bowl with the whisk attachment. Whisk at a low speed, gradually increasing to a high speed until stiff, glossy peaks form (about 10 minutes). 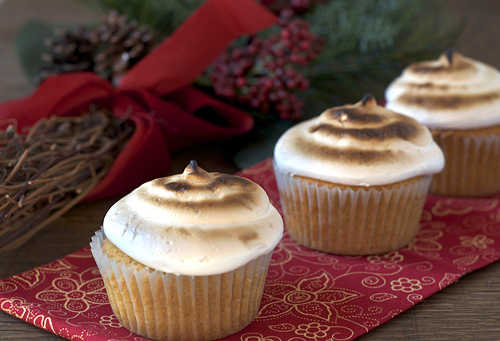 Frost the cupcakes, then torch or place under a broiler until toasted.